I have a few go-to eye creams and serums, but one thing that I’ve longed for is an eye treatment that could easily be used both morning and night. While I already have one on my go-to list that fits the bill, Blissoma Solutions’ new Bright Eye Vitalizing Nutrient Serum has earned a spot in this list as well. 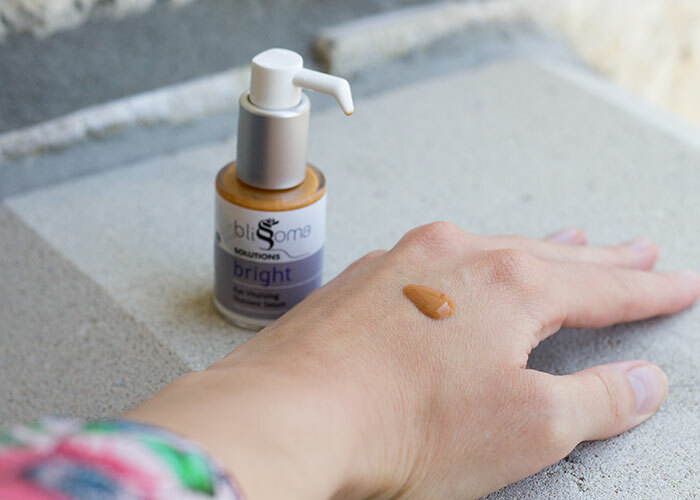 Made with 19 active ingredients, Blissoma Solutions Bright Eye Vitalizing Nutrient Serum is a non-sticky, non-oily lightweight, almost-watery serum that absorbs quickly and leaves no strange coloring on the skin (something I was concerned about when I first pumped the copper-colored product onto my hand). It doesn’t really have a scent that I can detect, which is great for those of us who are scent-sensitive or just don’t need the frills of too many essential oils (especially around the eye area!). Always one to outdo herself, Blissoma founder Julie Longyear sourced an exotic combination of high-performance ingredients for her new eye serum. You’ll see a few oldies but goodies like aloe juice, rosehip oil and argan oil in the mix, but infusions of yerba mate, rose root, gotu kola, comfrey, eyebright and more provide anti-aging benefits thanks to a jolt of vitamin C, ferulic acid and other skin-protecting antioxidants that the delicate eye area desperately needs. With so many amazing ingredients packed into one product, what’s even more exciting about Blissoma Solutions Bright Eye Vitalizing Nutrient Serum is that you can truly get away with half a pump to cover both eyes. Blissoma says that each pump jar of treatment contains enough for approximately a two-month or so supply when used once daily. If you use just half a pump (seriously, you don’t need that much), well, you do the math. After using Blissoma Solutions Bright Eye Vitalizing Nutrient Serum daily for a few weeks, I noticed that the skin around my eyes appeared brighter (without the help of shimmering mica) and the perpetual puffiness I feel was a little less obvious. 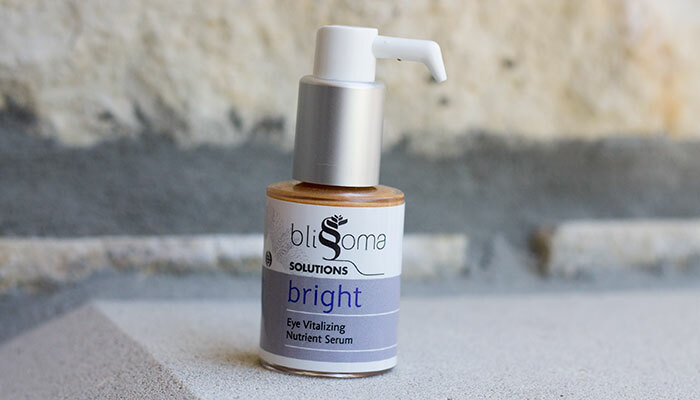 The best thing about Blissoma Solutions Bright Eye Vitalizing Nutrient Serum, though, from an oily-skinned girl’s perspective, is that it doesn’t feel overly rich / thick / creamy / clogging. That’s huge for those of us prone to milia, and it’s especially wonderful to have an eye treatment like this as we go into warmer weather and can’t handle too much product on our skin. Dry-skinned ladies, I’m not sure how this will fare for you.You may opt for the full pump to get that extra shot of non-oily moisture. Blissoma formulated this eye serum with mature skin in mind, so I can’t imagine it not delivering. So, back to the bottom line. Would I repurchase this? Yeap! I think it’s an interesting formula, and I really like the lightweight feel and impressive ingredients list. The pricing is fair, and I think this will be a staple eye serum for day and night during a muggy Kansas City spring / summer. Have any dry-skinned gals tried Blissoma’s new eye serum? What do you look for in a good warm-weather eye treatment? Do you use the same eye product for both day and night? Tell me in the comments section!